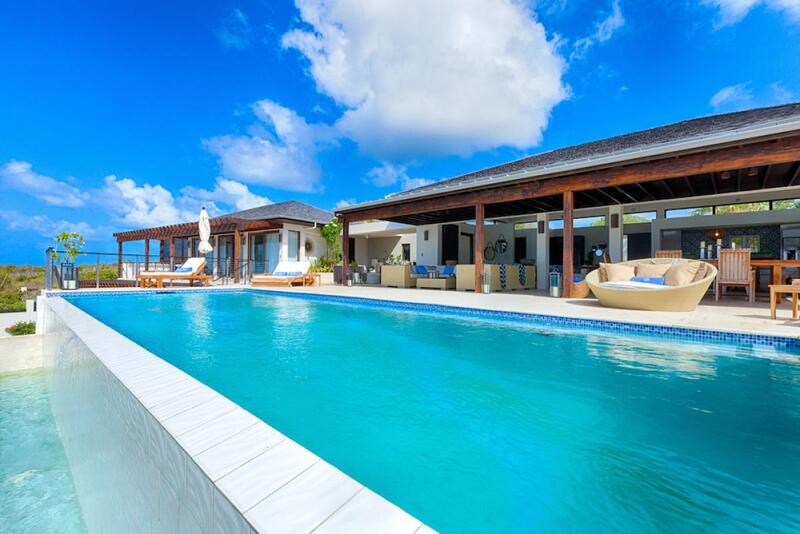 If you dream of your own secluded beach, dream no more - you’ve found it at Triton Villa. But there’s more… You get 6 bedrooms, 6.5 baths, an open kitchen, indoor/outdoor living and dining areas with full decks, a media room, and an infinity pool. The unique use of wood, along with stone and concrete, make this place uniquely upscale. Triton Villa at Kamique is a contemporary home near Little Harbor and LockRum Bay. This vacation rental overlooks the sea and St. Marten’s distant mountains, and is perfect for multi-generational families, destination weddings, and executive retreats. Kamique is on its own secluded cove beach, and Triton has a 180º ocean view. There’s a private beach pavilion, double loungers, and snorkeling gear for villa guests. The infinity-edge pool faces the view, and a stone terrace borders three sides. Loungers, day beds, and umbrellas sit around the pool. Under the veranda, there’s a plush, U-shaped sectional and a wooden dining table. Off to the side, guests can recline in the cozy sitting area and read, drink, or watch the waves roll in. Wood, stone, and concrete runs throughout the interior and exterior. There is a spacious living and dining area decorated in sleek whites and blues, with plush furnishings and a wall that opens fully to the ocean view. The modern, open plan kitchen has a breakfast bar, stainless steel appliances, an espresso machine, and mosaic-tiled backsplash. The media room offers comfortable seating, a computer, and a large flatscreen TV. It has videos games, a Wii, various board games, a poker table, a DVD library, and a powder room. All six bedrooms have an ensuite bathroom, a flatscreen TV, and window screens. On the main floor, there are two master bedrooms with ocean views. Each has a bathtub, an outdoor shower, and a king bed. There’s another king suite on the ground floor, with an ocean view and access to the garden view suite. There are three more suites on the ground level. Two have two twin beds and one has three twin beds. The twin beds can be made up as a king. Triton Villa has signing privileges at CuisinArt Resort and Spa, which includes beach chairs, restaurants, bars, a spa, and a golf course. These privileges are available year-round, except for the holiday season. Small cove beach within walking distance, shared with Anani and Aquamarie villas. It's a good snorkeling beach. Our stay at Triton Villa Kamique was amazing! Not only is the villa beautiful, but the staff took care of our every need as well. The bedrooms, bathrooms, living space all beautiful and immaculate. The views from the villa never get old, We had a great time watching the sailboats racing by on Anguilla Day. The villa itself has a great layout with bedrooms separated around an open air great room. We traveled with couples, but it would be a great space for families as well. It is on the windy side of the island which was so nice to always have a breeze and never get too hot. The villa is located in a perfect location only a short drive to all the restaurants. We were too lazy to cook dinner, but the house is fully stocked with everything you can think of if you choose to. I can’t recommend Villa Triton enough…we can’t wait to go back! Shawna was great! So helpful with any questions I had and set up our ferry to and from St Martin, our rental car, as well as giving us a great list of restaurants and things to do! Discount weekly rate of $61,600. Applies to bookings 10 nights or more. Good for stays from Dec 18, 2019 to Jan 5, 2020. Must book by Dec 12, 2019. Discount weekly rate of $49,753. Applies to bookings 14 nights or more.